How should I prepare for UFE? After your interventional radiologist has determined that your fibroids should best be treated with embolisation, he will let you know how to prepare for the intervention. You will usually be admitted to your hospital ward the day before your procedure. You may be given some sedation during the procedure. You will be asked to remove your clothes and put on a hospital theatre gown. If you have previously reacted to intravenous contrast X-ray dye (the dye used for kidney X-ray and CT scanning) or have any other allergies please let your interventional radiologist know before you are admitted. Blood tests will be performed while you are on the ward; these will include hormone levels and haemoglobin checks, the latter to check if you are anaemic. Usually the embolisation is carried out under local anaesthesia during a short stay in hospital. The interventional radiologist makes a small nick in the skin (less than one quarter of an inch) in the groin to access the femoral artery, and inserts a catheter (a tiny tube, like a piece of spaghetti) into the artery. Local anaesthesia is used so the needle puncture is not painful. The catheter is threaded through the artery to the uterus while the interventional radiologist guides the procedure with the help of a moving X-ray (fluoroscopy). 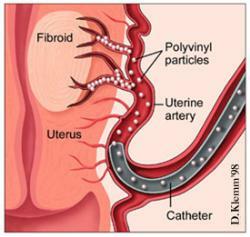 X-ray “dye” is injected into the catheter to visualize the blood supply to the fibroids. You will feel a momentary hot flush in your pelvis. It will “tweak” your bladder and make you feel as if you have wet yourself, this will last a few seconds. As the uterine artery is accessed you may feel further tiny hot flushes as the radiologist injects a small amount of the “dye” to visualize the vessel. 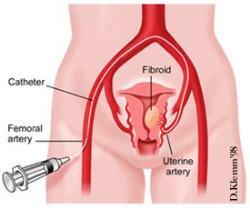 The catheter used to perform UFE is introduced through a small nick in the groin and threaded to the uterine artery. After identifying abnormal arteries supplying blood to the fibroids, the interventional radiologist injects tiny plastic particles the size of grains of sand into the artery. This cuts off the blood flow and causes the tumour (or tumours) to shrink. The artery on the other side of the uterus is then treated. The skin puncture where the catheter was inserted is cleaned and covered with a bandage. Embolisation blocks the blood supply to the fibroid, causing it to shrink. Every patient’s situation is different, and it is not always easy to predict how complex or how straightforward the embolisation will be. Some uterine fibroid embolisations do not take very long, perhaps an hour. Other embolisations may be more involved and take longer, perhaps two hours. Expect to be in the radiology department for two hours. Fibroid embolisation usually requires a short hospital stay. Pain-killing medication and medication that controls swelling are typically prescribed following the procedure to treat cramping and pain. Fever sometimes occurs after embolisation and is usually treated with paracetamol (acetaminophen). Many women resume light activity after a few days and the majority of women are able to return to normal activity within one or two weeks. You will have to see your IR for a check-up one month and six months after the procedure. A control MRI will probably be prescribed after three or six months.